Important new archaeological discoveries have been made on the coastal plain of Fujairah and in southern Ras Al Khaimah, not far from the village of Muna’i as a result of work being carried out in association with the building of the new water pipeline from the Fujairah coastal town of Qidfa to Al Ain, it is announced today. The water pipeline, and an associated desalination plant are being constructed for the new Union Water and Electricity Company, UWEC, created last year under the aegis of the UAE Offsets Group. The plant will have an installed daily production capacity of 620 mg of electricity and 100 million gallons of water, with water being pumped through a pipeline over the Hajar Mountains to Al Ain. In accordance with relevant federal and local environmental protection legislation, UOG requires that environmental studies and archaeological surveys are carried out as an integral part of all projects, in order to identify and, where possible, to protect areas of environmental or archaeological sensitivity. As part of this process, experts from the Abu Dhabi Islands Archaeological Survey, ADIAS, were commissioned to undertake an environmental and archaeological baseline study of the 180 km. pipeline route from Qidfa, around 20 km. north of Fujairah City, to Al Ain. During the survey, over 20 previously unrecorded archaeological sites were identified. Of these, the most significant were in the southern part of Ra’s al-Khaimah, near Manduk and Muna’i, and on the Fujairah coastal plain, at Qidfa itself and near the village of Qurrayah. Following the identification of the sites, UOG, ADIAS, and representatives of the pipeline contractors, Technip / Al Jaber, and of consultants Fichtner and Dames and Moore worked together last month to agree on the necessary action to protect or investigate the sites. For those in the mountains, which included a large copper-smelting complex dating back to the mid and Late Islamic period (14th to 17th centuries AD), and near Qurayyah, it was decided to make minor amendments to the pipeline route and to fence the archaeological sites so that they could be investigated at a later date. The sites at Qidfa, however, lie close to the desalination plant and associated tank farm, and an alternative route for the pipeline did not exist. It was, therefore, decided that an urgent archaeological investigation be undertaken by ADIAS at Qidfa. Working closely with representatives of UOG and Technip / Al Jaber, the ADIAS team, led by Academic Director Dr. Geoffrey King, of London University, first surveyed and marked the sites, to identify those which would be affected by the pipeline route. This was followed by a systematic collection of all pottery from the surface of the site. Study of the pottery shows that while much of it can be dated to the Late Islamic period (15th Century to 18th Century), some comes from the early and mid-Islamic periods (7th to 14th Century), and some is of Late pre-Islamic date (3rd to 7th Century AD). Some other pieces of pottery have not yet been definitely identified, but may date back to the local Iron Age (1300 – 300 BC), or even to the Bronze Age (c. 3000 BC to 1300 BC). With the pottery collection completed, Dr. King and an associate then excavated some of the ancient architectural features visible on the Qidfa plain. He was assisted by labourers provided by the Fujairah Museum on the instructions of Supreme Council member and Ruler of Fujairah His Highness Sheikh Hamad bin Mohammed Al Sharqi, who also provided useful advice on the minor re-routing of the pipeline at Qurayyah. The features examined by the ADIAS team included an ancient falaj (irrigation channel) a large wall and the remains of a fortified tower and two adjacent walls, perhaps originally a defensive structure. Almost all of these have now been protected with fencing. Further work at Qidfa is planned for later this month, while, with the key sites now clearly identified, construction of the pipeline route is continuing as planned. A fourth phase of archaeological investigations into a complex of sulphur mines at Jebel Dhanna, in Abu Dhabi’s Western Region, has recently been completed by the Abu Dhabi Islands Archaeological Survey, ADIAS, it is announced today. The investigations were carried out with the support of the Abu Dhabi Company for Onshore Oil Operations, ADCO, and focused on the part of Jebel Dhanna that falls within the oil export terminal facilities of ADCO. The sulphur mines, the only ones of their type known anywhere in the United Arab Emirates, were first recorded by ADIAS during an Archaeological Baseline Study of the ADCO concession area in 1998. The second and third phases of study of the mines were carried out in 2000 and 2001, and the recent work brings to an end the fieldwork component of the ADIAS study. The recent fieldwork was directed by Daniel Hull, ADIAS’s Resident Archaeologist, with the support of Stephen Rowland, an environmental archaeologist from York, in Britain. In all, a total of 180 mine shafts have been recorded by ADIAS within the ADCO terminal area, some going as deep as 10 or 12 metres into the hillside. Many are also linked to underground chambers and tunnels, with domed roofs, ledges, ventilation and light holes and steps cut in the rock to allow access from above. Preliminary estimates suggest that as much as 1500 cubic metres of rock may have been removed during the mining operations, with as much as 90 tonnes of sulphur being recovered. The remains of a number of collapsed rock shelters and water catchment systems have also been recorded by the ADIAS team, while environmental data has been recovered which will help to provide an idea of what the miners ate, and how they lived. With the fieldwork component of the investigations now completed, the ADIAS team are now analysing the finds from the mines, and are also arranging for radiocarbon dating to be carried out on ash and charcoal recovered from the vicinity of some of the shafts. This will help to provide an idea of the date of the mining operations. Pottery collected from around the mine sites is from the Late Islamic period, 100 to 400 years ago. Historical research, however, has not yielded any references to the mining operations over the last couple of hundred years, and it seems, therefore, that the main phase of activity at Jebel Dhanna may have taken place 200 to 400 years ago. A regional trade in sulphur is known from the late 17th and 18th Centuries, with records of sulphur shipments being known from mines on the Iranian side of the Arabian Gulf. Once the analysis of the finds is complete, ADIAS plans to prepare a special publication on the Jebel Dhanna mines. ADIAS has so far identified around 125 archaeological sites within ADCO’s sphere of operations. The Abu Dhabi Islands Archaeological Survey was established on the instructions of President His Highness Sheikh Zayed bin Sultan Al Nahyan in 1991, and operates under the patronage of His Highness Lieutenant General Sheikh Mohammed bin Zayed Al Nahyan. Charged with responsibility for archaeological and fossil sites on the coast, islands and elsewhere in Abu Dhabi’s Western Region, it has so far recorded over 1000 archaeological sites. Two British scientists have recently completed a study of UAE crabs. Dr. Peter Hogarth, a marine biologist from the Department of Biology at the University of York in the UK, and Dr. Mark Beech, of the Abu Dhabi Islands Archaeological Survey (ADIAS) and a Research Fellow in the Department of Archaeology at the University of York, have been systematically recording and collecting the crab species which occur along the coastline of the United Arab Emirates. The purpose of this study is to compile a reference collection in order to identify archaeological crab remains recovered from a number of archaeological excavations in the Emirates. The crab reference collection resulting from this study will in the future be retained within the Marine Environment Research Centre (MERC) which is part of the Environmental Research and Wildlife Development Agency (ERWDA) in Abu Dhabi. An important part of Hogarth and Beech's work is a baseline study which maps the occurrence of modern day crab species along the UAE coastline. One of the interesting outcomes of their work is the first authenticated record in the Arabian Gulf of the crab species, Scylla serrata or mangrove crab. Although the presence of mangrove crabs has been suspected from observation of burrows, or from anecdotal evidence, no firm records existed until recently, when a single specimen was reported from Ras al-Khaimah, caught in a mangrove lagoon. A note on this has recently been published by Hogarth and Beech in the locally produced publication, "Tribulus", the journal of the Emirates Natural History Group. The mangrove crab is the largest of the swimming crabs (family - Portunidae), reaching a carapace breadth of 22-23 cm and a weight of 1.5 - 2.0 Kg. It is widespread in the Indian Ocean and western Pacific, and in many areas is an important food species either trapped or reared in aquaculture systems. This species is strongly associated with mangroves, where it spends much of its life cycle, excavating burrows in the soil from which it emerges to forage. 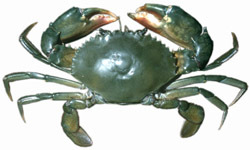 Remains of mangrove crab have been recognised at several archaeological sites in the Emirates including the Iron Age site of Rafaq in the Wadi al-Khawr, and in Sasanian/Islamic levels at Kush in Shimal, Ras al-Khaimah. The Rafaq site is located some 25 km inland from Kalba on the east coast of the Emirates. The strong association of this particular crab species with mangroves indicates that human populations were dependent on mangroves, and were already exploiting them for food and other resources like fuel and timber, as long as 3000 years ago. Why should a species, once abundant enough to be a significant food source, have largely vanished from the Arabian Gulf? The most probable explanation in this case is the loss of the mangrove habitat. In the past mangroves were much more widespread in the Gulf. Their use as timber for architecture and boat-building, as well as for fuel, has severely depleted mangroves in the Gulf, reducing them in area and diversity to relatively small patches, almost exclusively of the Grey mangrove, Avicennia marina. 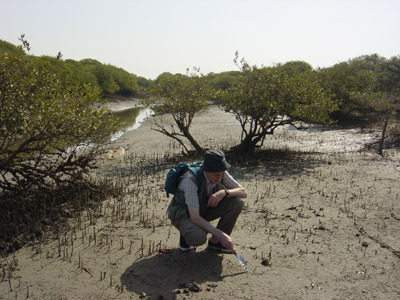 Dr. Peter Hogarth of the University of York searching for crabs in Ras Al Khaimah. The mangrove crab, Scylla serrata. 3000 year old mangrove crab claws from archaeological deposits at the Iron age site of Rafaq. Further fieldwork carried out at an archaeological site at the Abu Dhabi Airport Golf Club, coupled with a detailed study of the flint tools recovered during earlier work at the site have confirmed the importance of the site during the Late Stone Age period, around 5,500 to 4,000 BC, it is announced today. The Airport site was first discovered on a range of low hills inside the perimeter of the Golf Club in 1995, when a short season of fieldwork was undertaken by the Abu Dhabi Islands Archaeological Survey, ADIAS. That work showed that the site had been occupied during the Late Stone Age, the early to middle Bronze Age, around 3,000 BC to 2,000 BC, and in the Late pre-Islamic period, around the beginning of the Christian era. During late April, a review of the stone tools and animal remains from the site was undertaken by the ADIAS flint tools expert, Dr. Heiko Kallweit, from Germany's University of Freiburg, with the assistance of Dr. Mark Beech, ADIAS environmental archaeologist from Britain's University of York. This involved a detailed re-examination of material collected during the 1996 field season, as well as two further visits to the site, to search for new material that might have been uncovered as a result of the rains early last month. "This review and the two site visits have produced valuable new information," Dr. Kallweit said today. "The site was proved to extend further than had been originally recognised, and a nearly complete flint arrowhead was recovered on the southern fringes of the site (Figures 1-2), as well as a lot of other worked flint material. 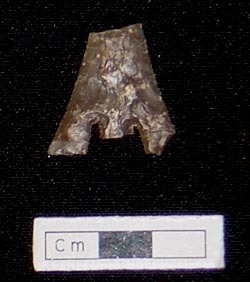 The arrowhead was of a type not previously known to have been found in the United Arab Emirates, although similar examples have been found in western Saudi Arabia and in Qatar. This find provides valuable new information on the possibility of trading routes stretching right the way across the Arabian peninsula during the Late Stone Age period." During the site visits, Dr. Kallweit also found a tiny crescent-shaped fragment of worked flint, known as a microlith, that provides useful insight into the way of life of the UAE's Late Stone Age inhabitants. Two further examples were also identified during the detailed review of material collected during the earlier phase of fieldwork. "The three pieces are "teeth" of flint that would have been set into a wooden handle for use as an early sickle or knife for cutting grasses," Kallweit said. "Once again, no evidence of such a sickle has previously been recorded in the Emirates, although examples are known from other regions in the Near East. The discovery confirms that the people were harvesting grasses or grains, although it is not possible yet to determine whether they were growing crops, or just harvesting wild plants." Along with evidence of sheep, goat and cattle bones found on archaeological sites on Dalma, in the far west of the UAE, and at Jebel Buhais, in Sharjah, the sickle pieces confirm that the Late Stone Age inhabitants of the UAE were not simple hunters and gatherers, but were a pastoral community with a much broader economic base to their lifestyle, Kallweit says. The newly-identified information has prompted ADIAS to plan for a further season of fieldwork at the Airport site next winter. 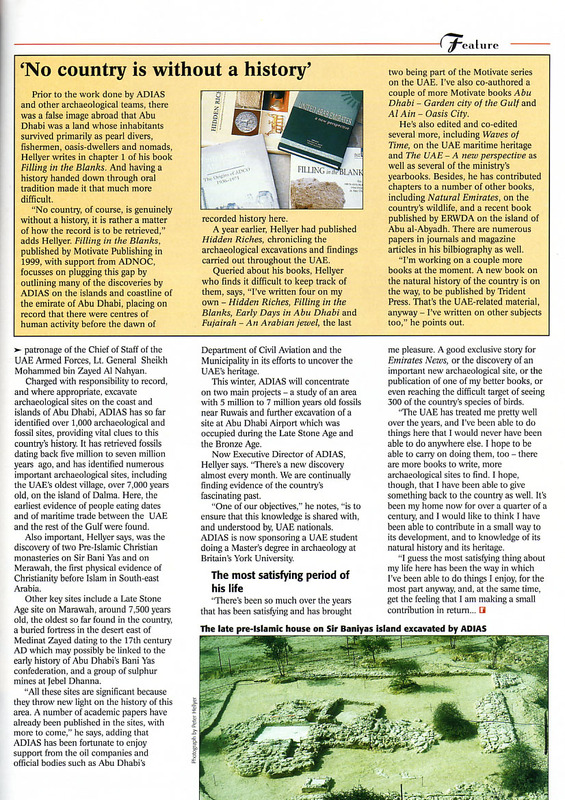 James McLean, Manager of the Abu Dhabi Airport Golf Club, welcomes the ADIAS plan. "The Club and its members are proud to have such an valuable archaeological site within its course," he said. "No other golf club in the country has anything like it, and we will provide ADIAS with any facilities and help that we can in order to help them discover more information about the site. We look forward to working with ADIAS next winter on this important study into the UAE's heritage and history." The first phase of archaeological investigations at the Abu Dhabi Airport Golf Club in 1996 were undertaken by ADIAS with the support of the Chairman of Abu Dhabi's Civil Aviation Department, HE Sheikh Hamdan bin Mubarak Al Nahyan, and were supported by the Abu Dhabi Duty Free. "Our first phase of work proved the importance of this site, and we are grateful for the support provided by Sheikh Hamdan and by Abu Dhabi Duty Free, and for the way in which they have helped to preserve the site," says Peter Hellyer, the ADIAS Executive Director. "We hope that next winter's work will not only lead to yet more important discoveries, but will also show the way in which bodies like Civil Aviation and Duty Free, as well as the Golf Club, can work together with us in the protection of the country's heritage." 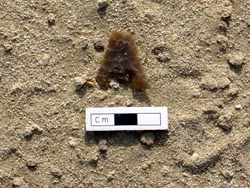 Figure 1 - The flint arrowhead found in-situ at the Abu Dhabi Aiport site. Figure 2 - The flint arrowhead from the Abu Dhabi Airport site. New Finds prove importance of AD Airport Archaeological Site (Source: www.uaeinteract.com). A short season of studying excavated material from pre-Islamic Christian archaeological sites on Abu Dhabi's islands of Sir Bani Yas and Marawah undertaken by specialists working for the Abu Dhabi Islands Archaeological Survey, ADIAS, has yielded important new dating about the structure of the settlements, and about their cultural links with elsewhere in the peninsula, it is announced today. The two sites, identified by ADIAS in 1991, on Sir Bani Yas, and 2000, on Marawah, are the only confirmed archaeological evidence of the presence of Christians in south-eastern Arabia in the period immediately before the coming of Islam in the 630s. The Director of the excavations at the two sites, Dr. Joe Elders, who is also in charge of archaeology for many of Britain's churches, and Dr. Emma Loosley, from the University of York, an expert in the early history of Christianity in the Arab Middle East, completed a two week study of the pottery and plaster from the Sir Bani Yas and Marawah sites last month. According to Elders and Loosley, a study of the plaster from the Sir Bani Yas site indicates that the inhabitants of the monastery were influenced by cultural links with Arab Christian communities in parts of the Levant, such as Syria. Historical research carried out by Elders and Loosley also suggests that the Christian communities of the Gulf were also closely involved in the pearling industry prior to the coming of Islam to the region. As part of plans for further study of the plaster, pottery and glass fragments from the sites, ADIAS will shortly be sending some samples to Britain for examination. This will permit comparisons to be made with other material from the middle of the First Millennium AD from the Gulf, Mesopotamia and Syria. Help in shipping the samples is being provided to ADIAS by the UAE representative office of oil company BP, (formerly British Petroleum), which has supported the work of ADIAS for several years. "We are delighted to be of assistance to ADIAS in their important programme of research into the heritage of the UAE," said Dr. Michael Daly, President, BP Gulf States Business Unit in Abu Dhabi. 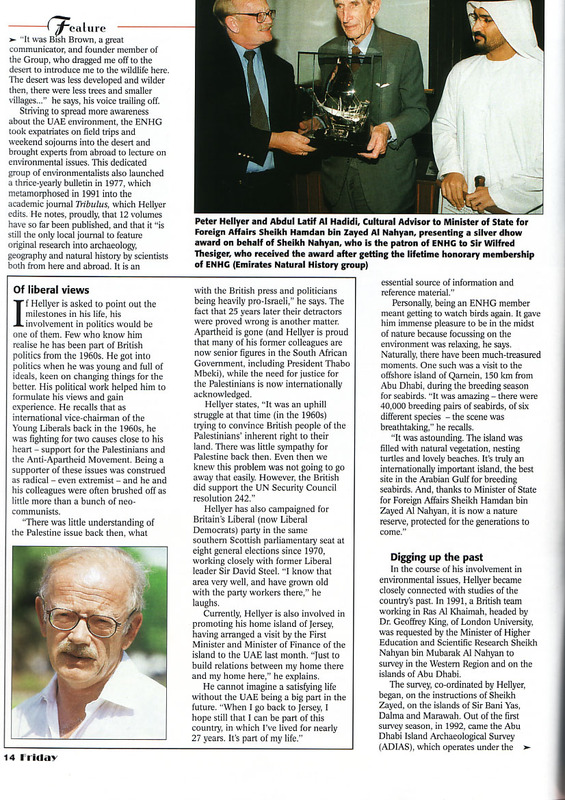 "BP has a history of nearly eighty years involvement with the country and is heavily involved in the UAE's current and future development programme, and it is a pleasure to extend this involvement into the field of historical research." Said an ADIAS spokesman ,"Over the years since ADIAS was first established, it has benefited substantially from the support extended by the local and foreign oil sector, including BP " . We are most grateful for this continued support from BP, which will help us to undertake further scientific research into the results from these two important archaeological sites." FOR IMMEDIATE RELEASE on 19 June, 2002. The Abu Dhabi Islands Archaeological Survey, ADIAS, has added full details of the six million year old fossils of Abu Dhabi's Western Region to its website, it is announced today. Dating from the Late Miocene period, the fossils were discovered during the late 1980s and early 1990s by the Abu Dhabi Miocene Project, a joint research study directed by Peter J. Whybrow (Natural History Museum, London) and Andrew Hill (Yale University, U.S.A.). Support for the research was provided by the Abu Dhabi Company for Onshore Oil Operations, ADCO. The majority of the fossils collected by the Natural History Museum/Yale University team come from Baynunah Formation outcrops located between the coast and the road from As Sila'a to Abu Dhabi. They include fossil bones of early ancestors of the elephant, hippopotamus, horse, crocodile and other animals. They indicate that at the time the animals lived, what is now Abu Dhabi's Western Region was a lush savannah type landscape with wide and slow-moving rivers, somewhat like East Africa today. "We would like to thank Peter Whybrow and his team for providing such an excellent and informative guide to the Miocene fossils of Abu Dhabi" said Dr. Mark Beech of ADIAS. "This information supplements our expanding web presence as one of the major providers of information concerning the archaeology and palaeontology of the region." A full scientific account of the geology and palaeontology of the Miocene period in the Western Region of Abu Dhabi was published by Yale University Press in 1999 and titled "Fossil Vertebrates of Arabia", edited by Peter J Whybrow and Andrew Hill. Mohammed, a UAE University driver, helping to excavate the jaw of a 6 million year old primitive hippopotamus skull (Hexaprotodon sahabiensis) in 1981. Future Perfect (Source: Gulf News) - read an article about Peter Hellyer, the Executive Director of ADIAS, which appeared in Gulf News Friday Magazine. Download the article as separate pages (.jpg files) page 1 - page 2 - page 3 - page 4. UAE history dates back to 7,000 years (Source: Uaeinteract.com) - read about the first in a series of lectures being given at Zayed University by the Abu Dhabi Islands Archaeological Survey. 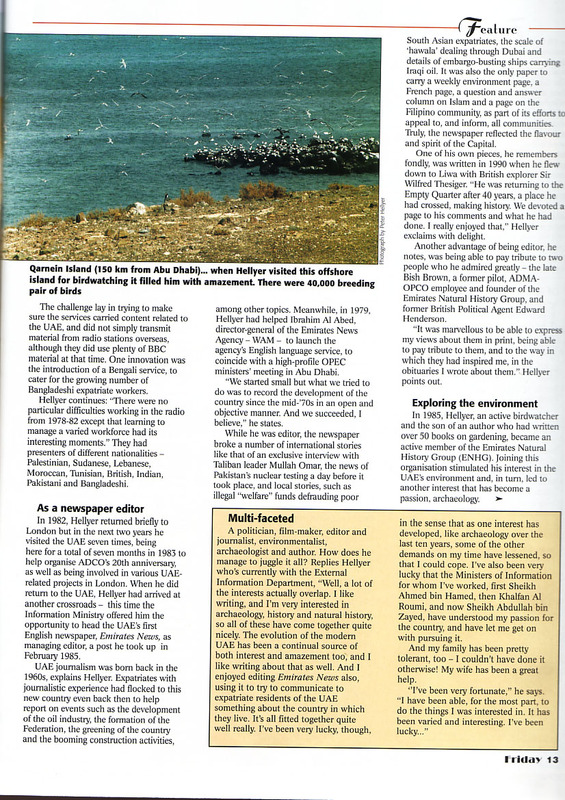 TAKREER backs fossil research at Ruwais - part 1 - part 2 (Source: WAM) - read about how Takreer is sponsoring ADIAS's work on Miocene fossils in Abu Dhabi. Takreer backs fossil research at Ruwais (Source: Uaeinteract.com) - read about how Takreer is sponsoring ADIAS's work on Miocene fossils in Abu Dhabi.